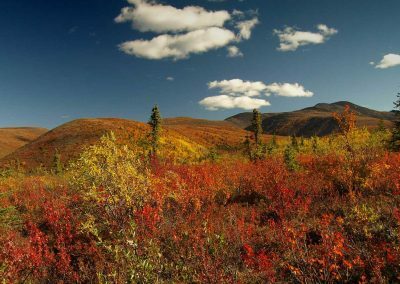 Experience this amazing tour during the most famous but also shortest season of the year, the so-called “Indian Summer”, which will surely touch your heart. 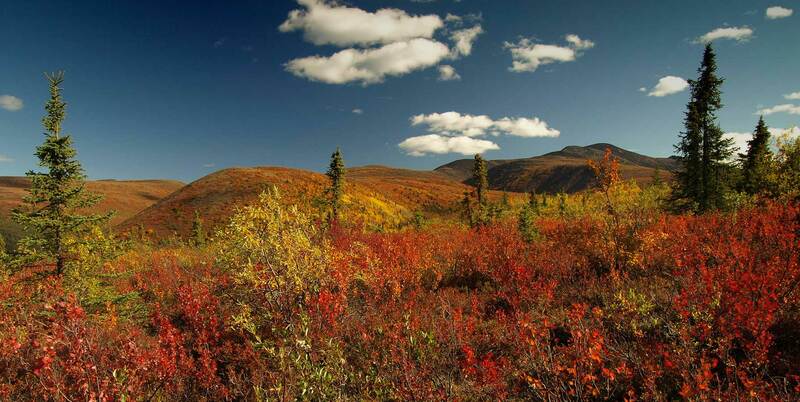 Mother nature shows us for a short period the beautiful discoloration of leaves of the aspen and birch trees. 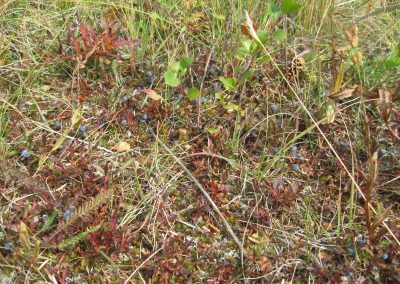 Shrubs shine from yellow over blood red to dark violet for a brief moment. Every nature lover will be captivated by the luminosity of the colors that are unparalleled. 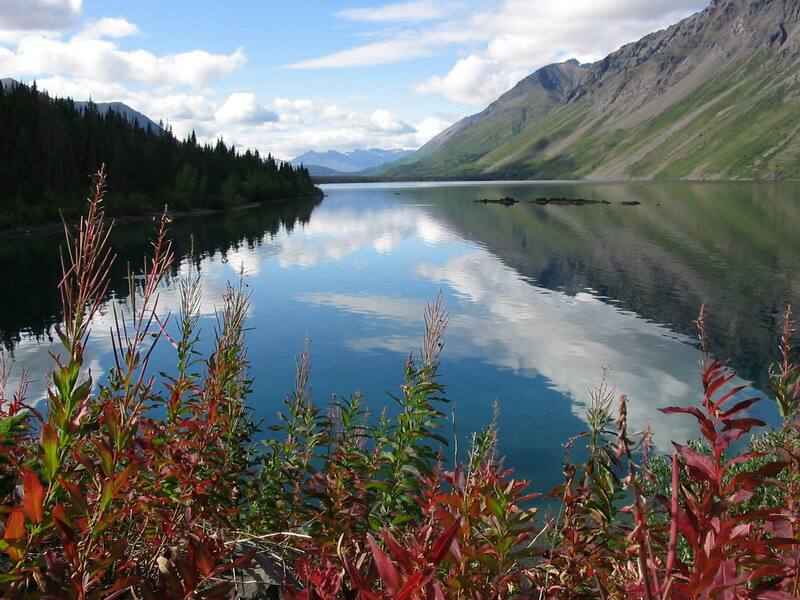 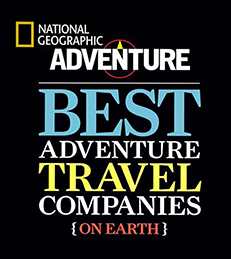 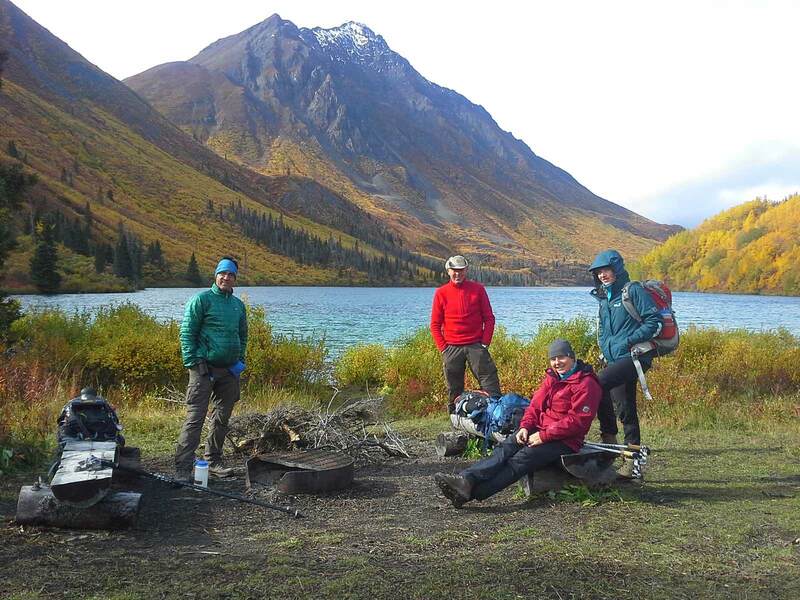 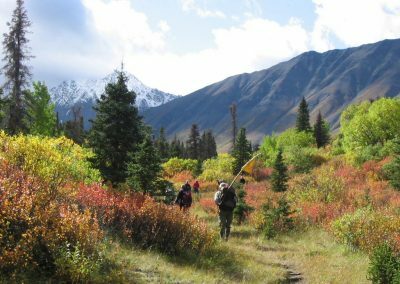 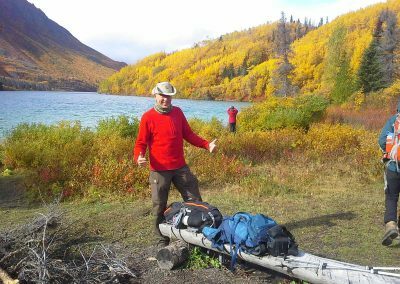 In the midst of this fascinating natural spectacle, we undertake four hikes in the breathtaking mountains of the Kluane National Park, before we fly with a float plane from Whitehorse to the end of Lake Laberge. 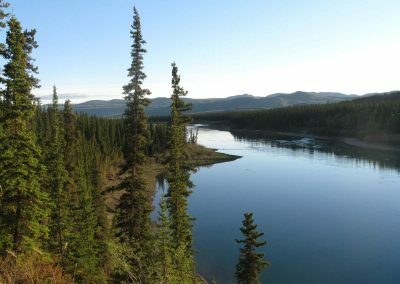 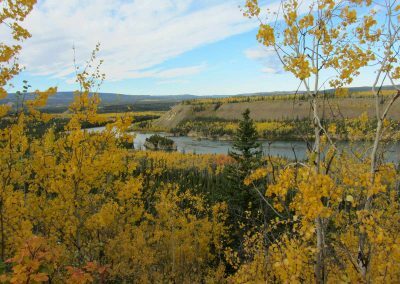 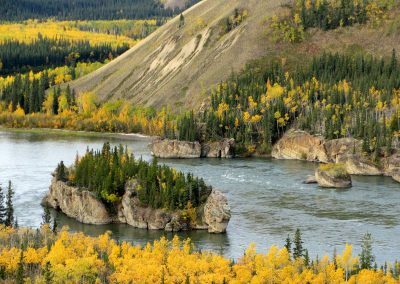 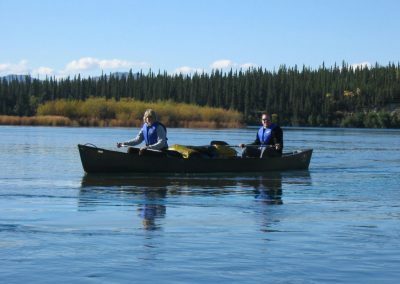 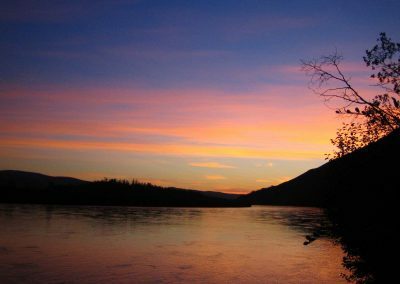 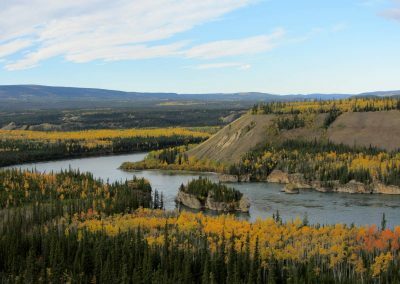 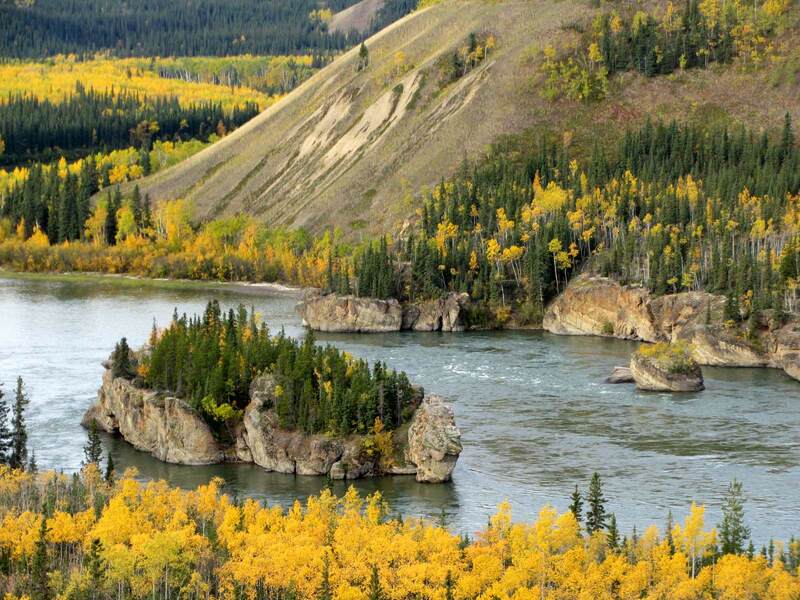 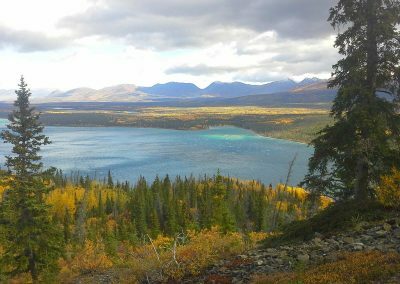 This part of the Yukon, also known as “30 Mile River”, is the most beautiful section on the Yukon River and is one of its kind. 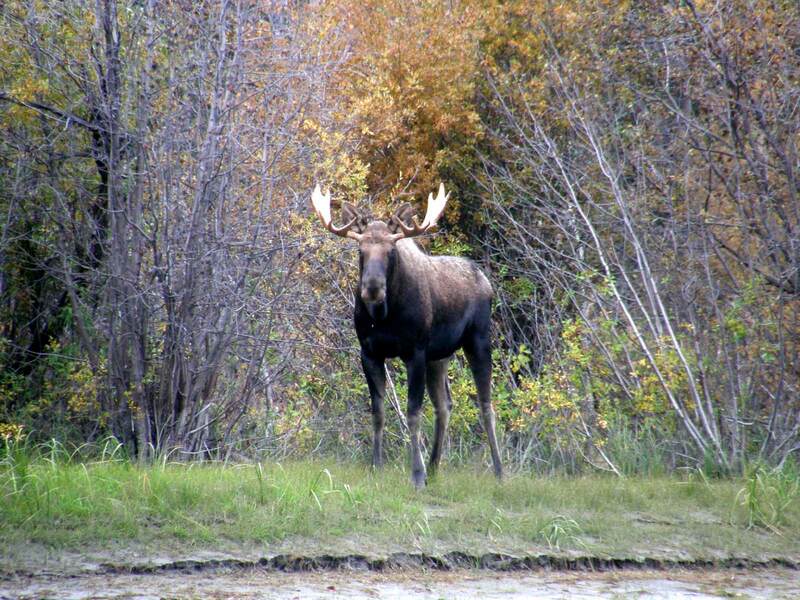 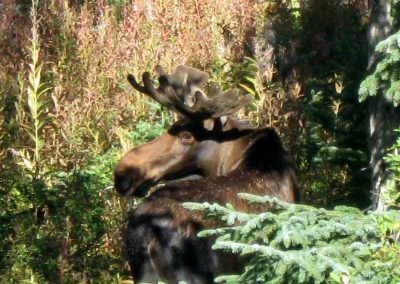 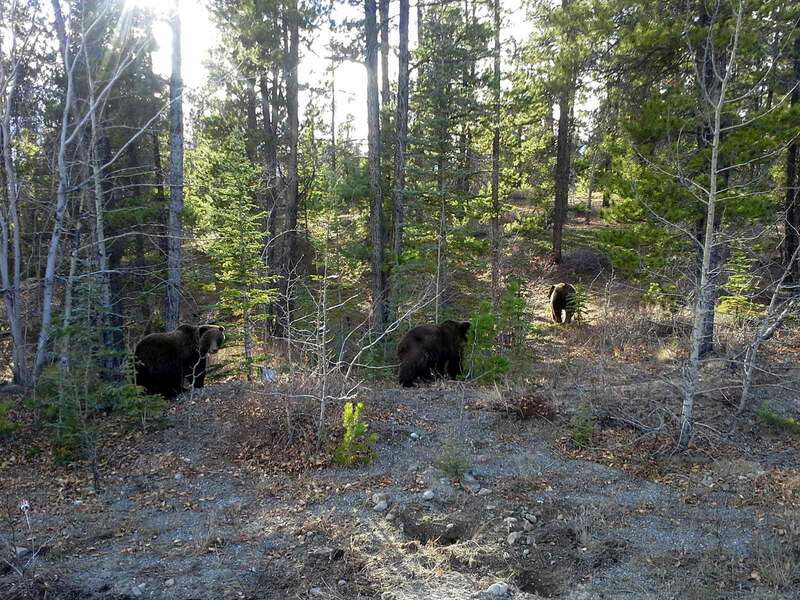 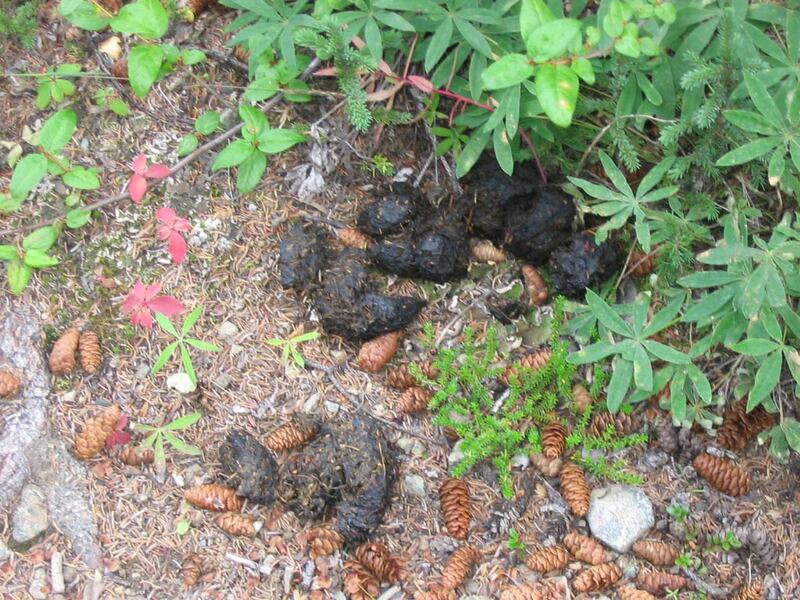 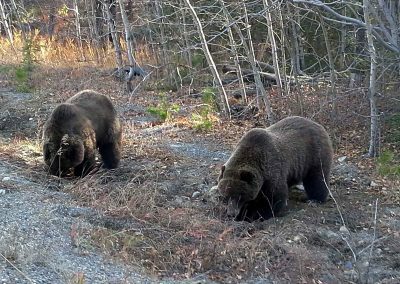 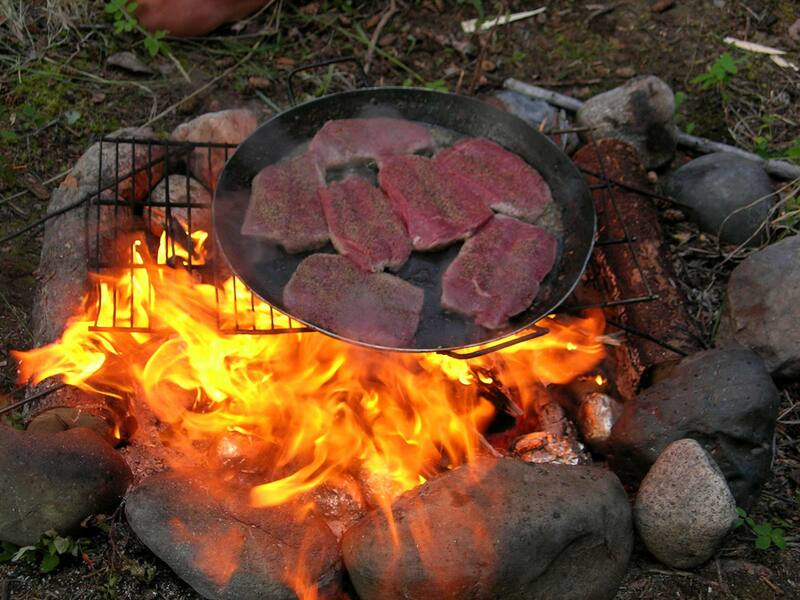 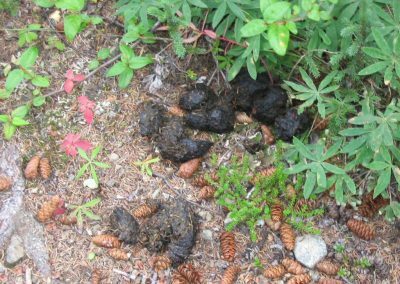 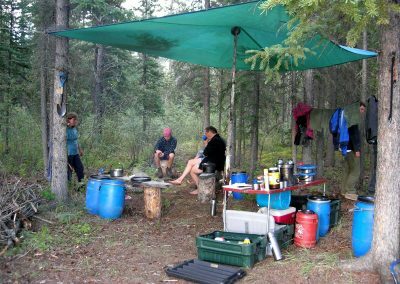 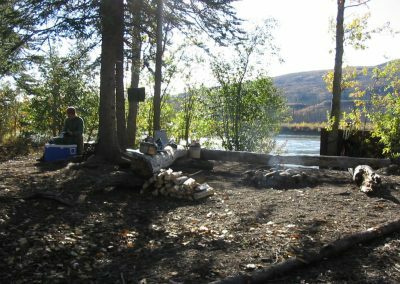 Away from civilization we experience the wilderness up close; Campfire in the wild, and perhaps we have the great fortune to observe a grizzly or moose bull with its powerful shovels on the shore. 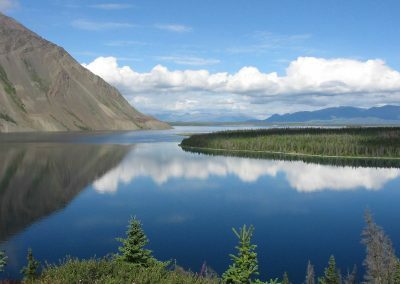 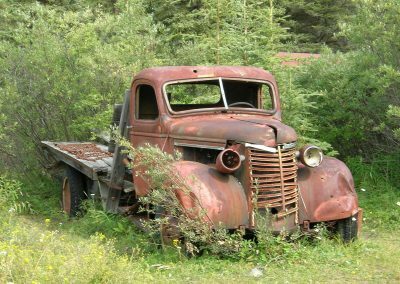 We begin our adventure tour with a drive west on the Alaska Highway towards Haines Junction, the small community at the Kluane National Park. 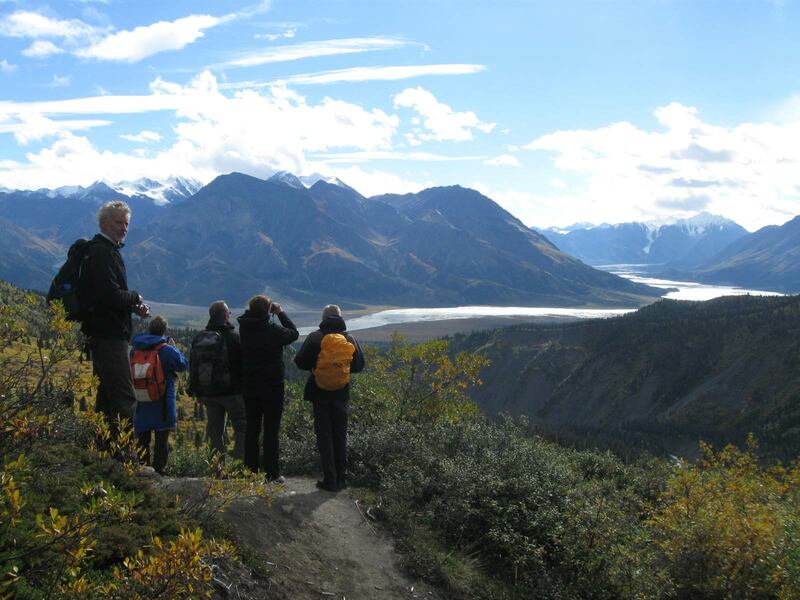 There we visit the Kluane Park Information Center to get the first impression of this area. 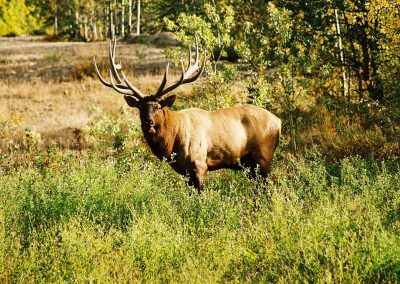 Here you will get all the information about the impressive park. 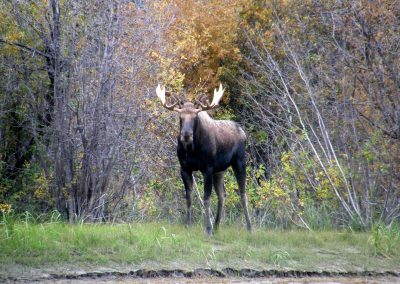 Slide shows and videos provide information on flora, fauna and animal life. 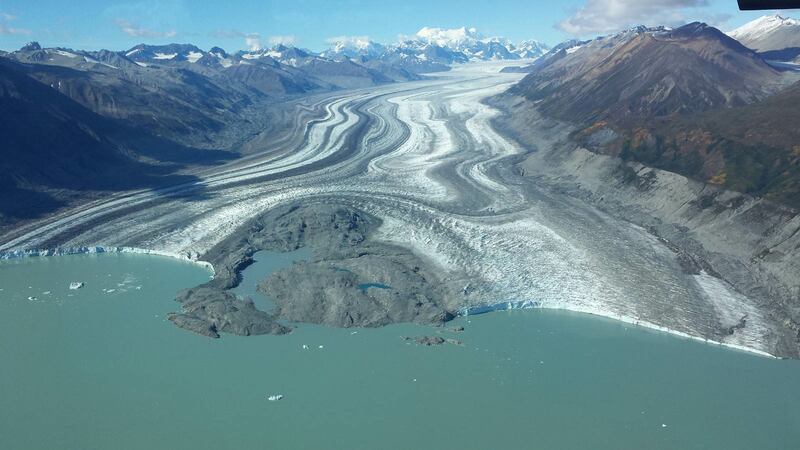 After we have informed us about the National Park, we continue to our accommodation, in the Alsek Valley, where we will spend the next five nights. In the afternoon we will take a short walk to nearby Spuce Beatle Trail. Our first hike takes us along Sheep Creek to the foot of the Sheep Mountain Ridge. 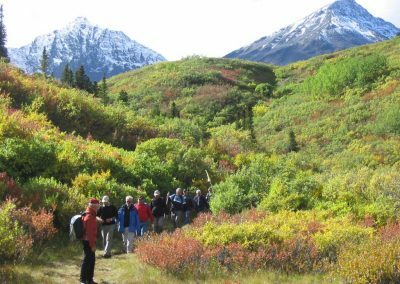 With our minibus we drive along the border of the National Park to the Sheep Mountain Visitor Center, from where we start our day hike. 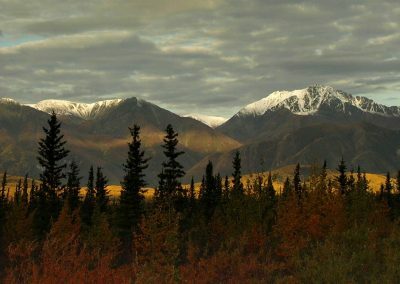 As the name implies, this mountain is home to Dall Sheep. 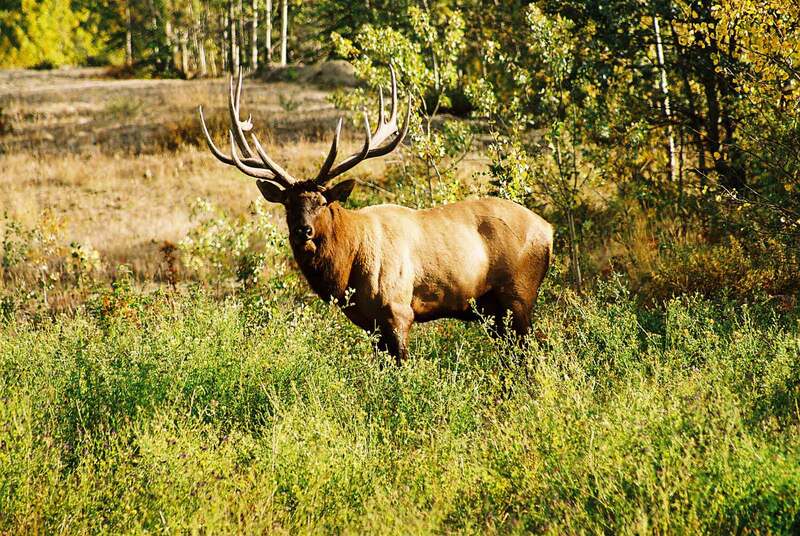 With some luck we can observe some of the animals at close range. 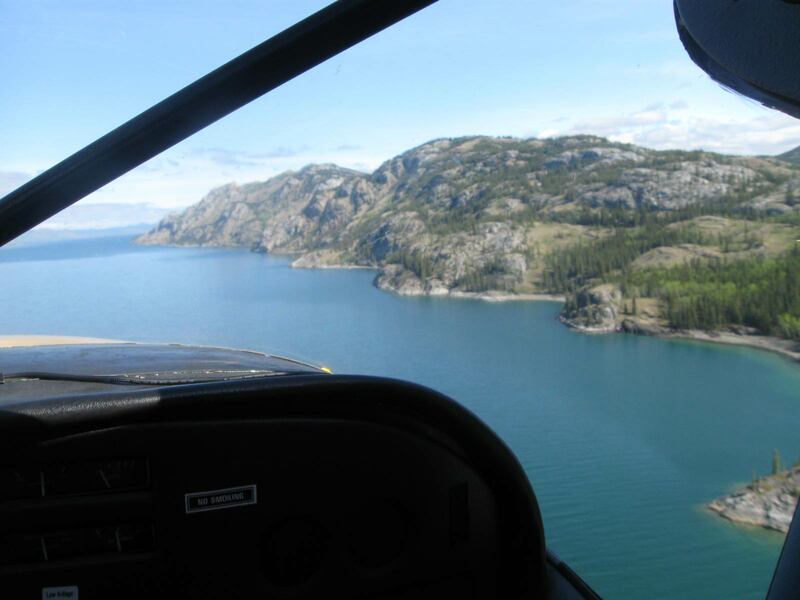 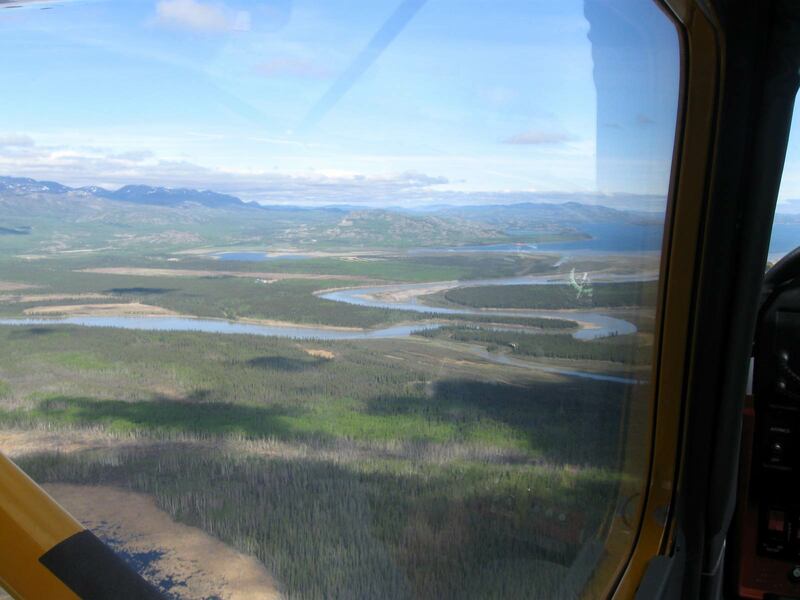 Further up we are expecting a magnificent view of the river delta and the Kaskawulsh glacier that feeds Slims River. 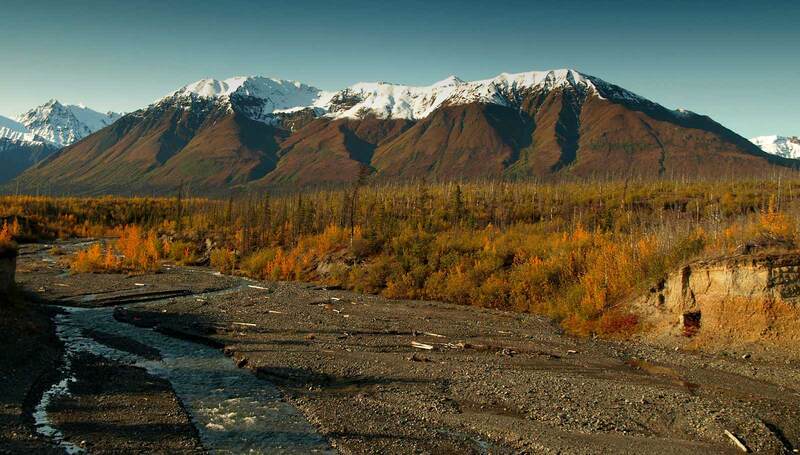 We will spend some time at this place and just enjoy the spectacular panorama presented to us. 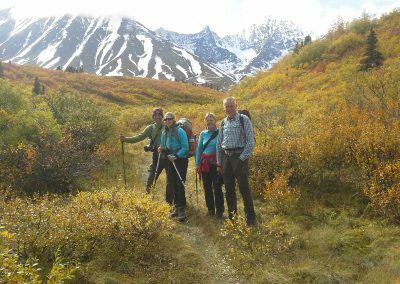 The hike is moderate and for the 10 km distance it takes 3 to 5 hours, elevation 430 m.
Today we head for the nearby Auriol Trail Loop. 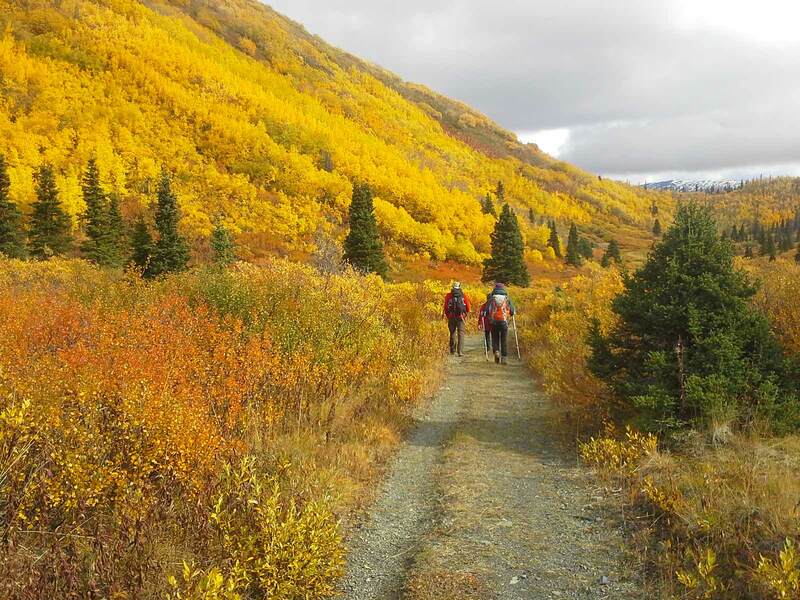 The hike leads us along a small stream into a very beautifull high plateau, where we will rest for our lunch break. 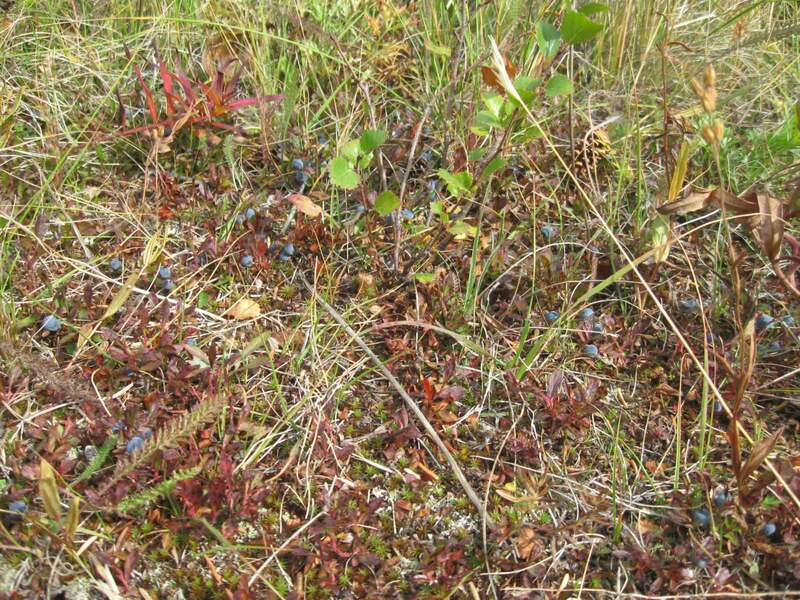 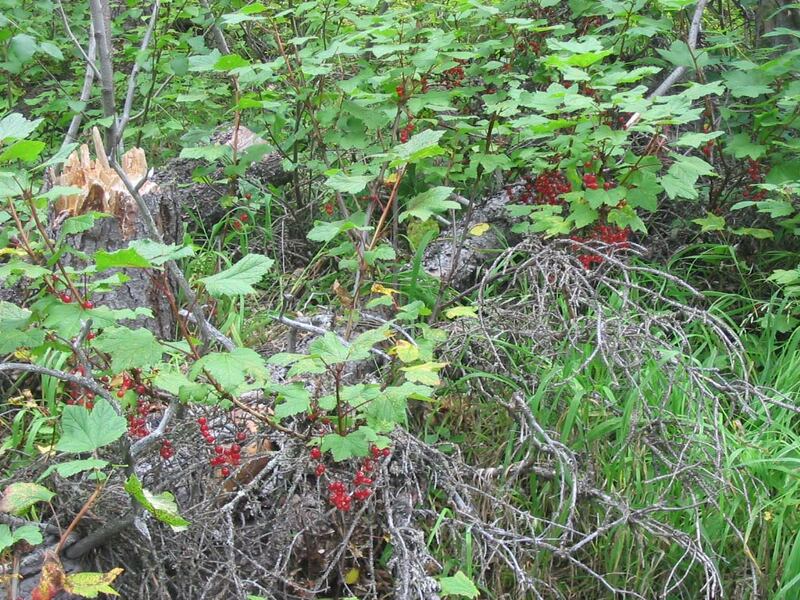 Along the trail we will find different berry bushes. 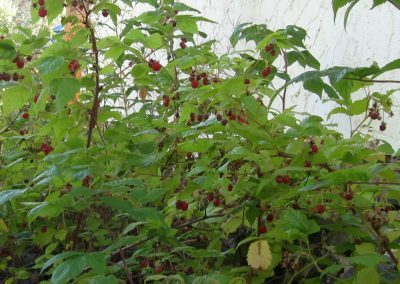 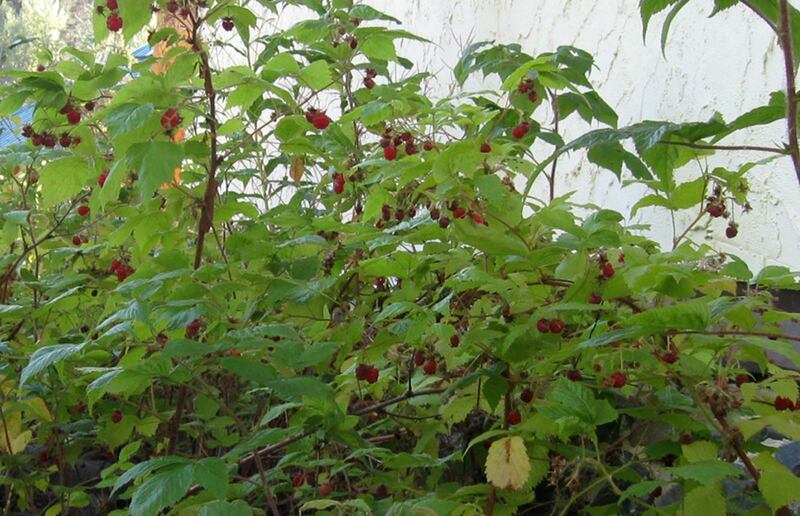 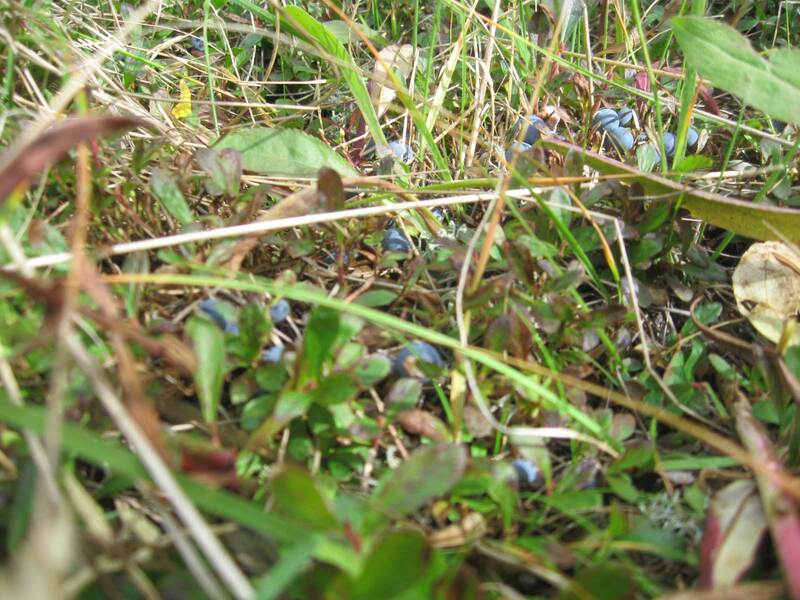 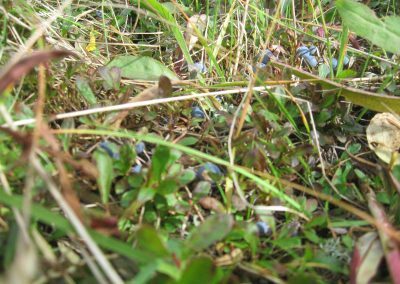 From August on we can enjoy the delicious wild berries directly from the bush. The hike on the Auriol Trail is easy and for the 15 km distance it takes 4 to 6 hours, elevation 400 m.
After the endeavour of the last few days, today we enjoy a shorter hike to Saint Elias Lake. 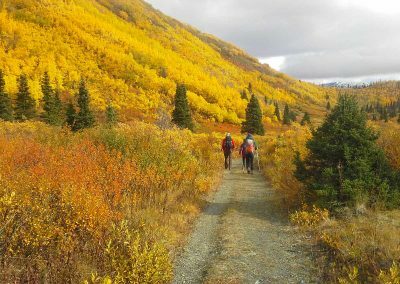 On this relatively short trip, we walk through a narrow, densely covered valley, which has a very special charm. 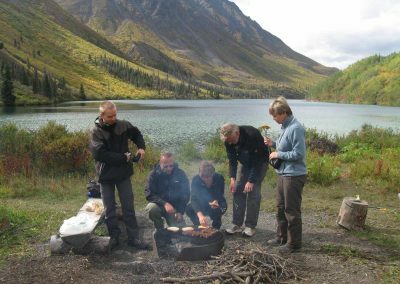 In the end, the beautiful Saint Elias Lake awaits us, where we make a small BBQ with a camp fire and grill some sausages for lunch. 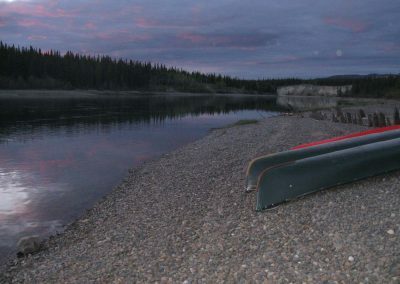 With a little bit of luck we might see one of the Loons close by, which nest in the summer month at this Lake. 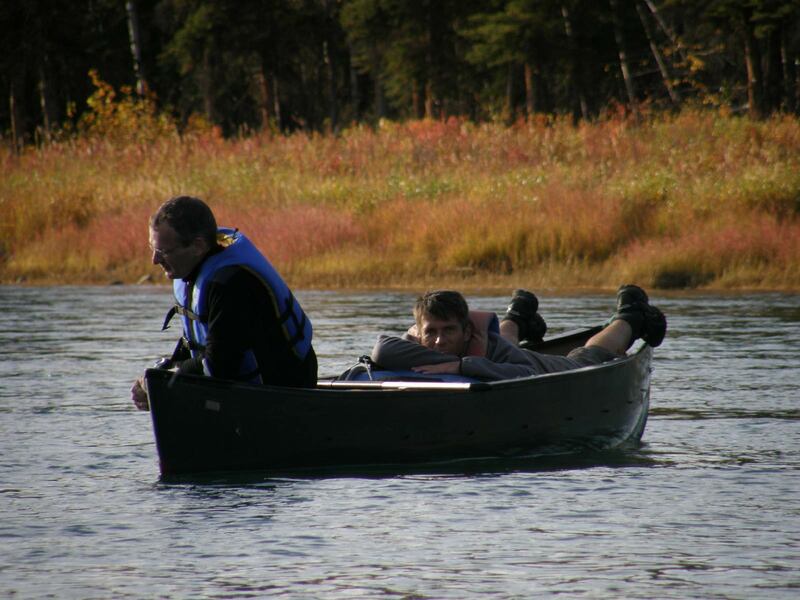 Afterwards, we make a trip to Klukshu, a First Nation summer village. 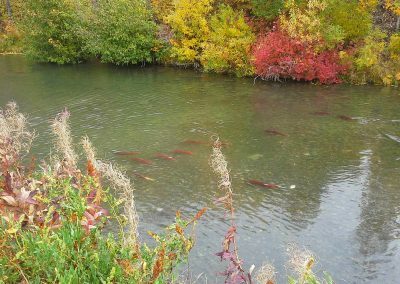 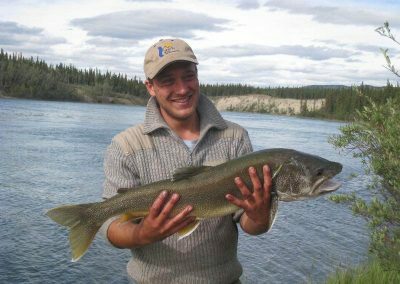 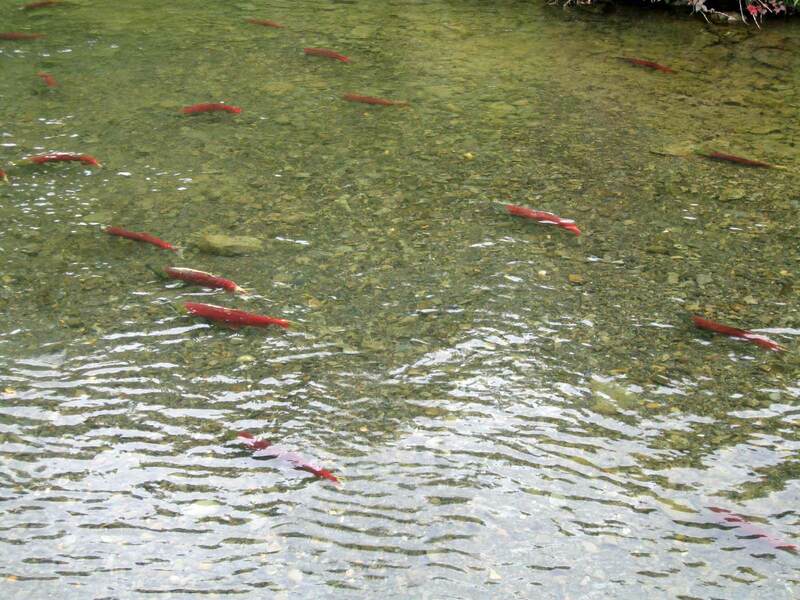 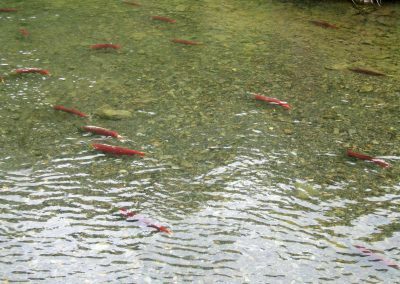 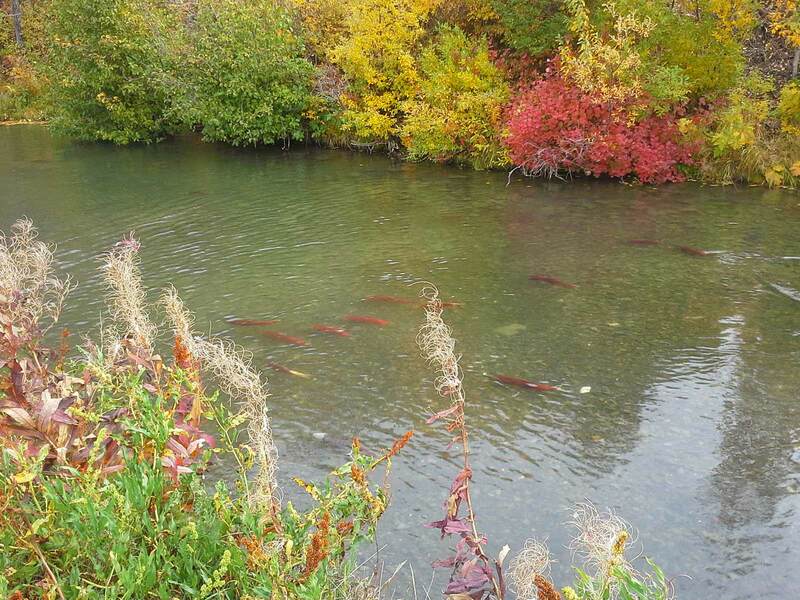 Depending on the season, we can watch the Champagne and Aishihik First Nations catching some Salmon, in their traditional way. 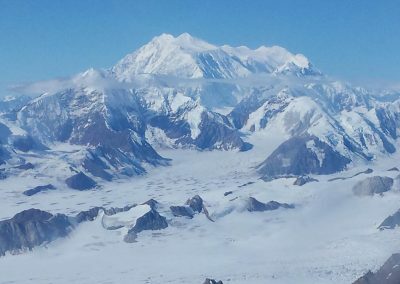 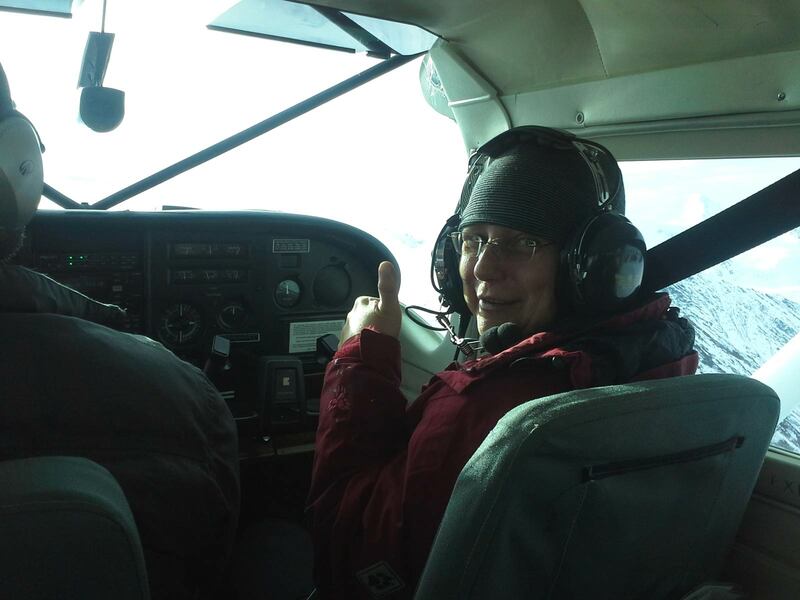 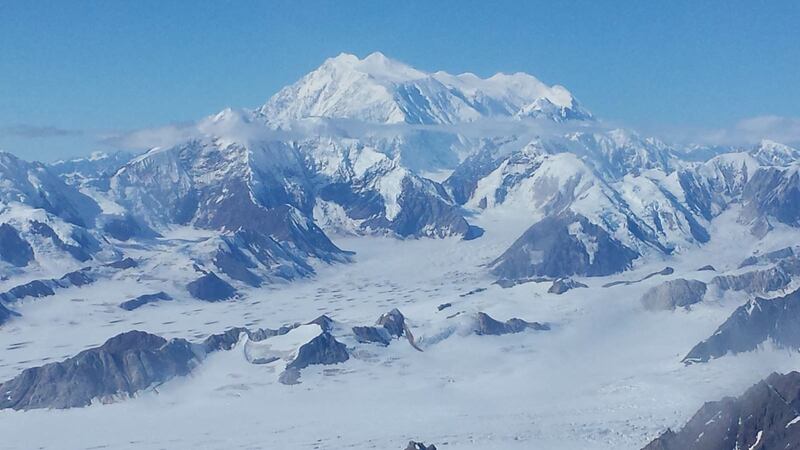 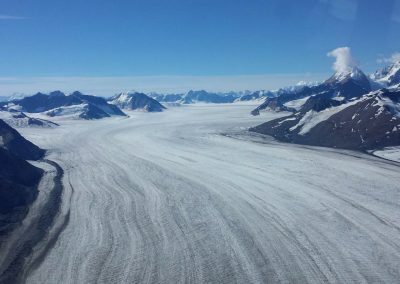 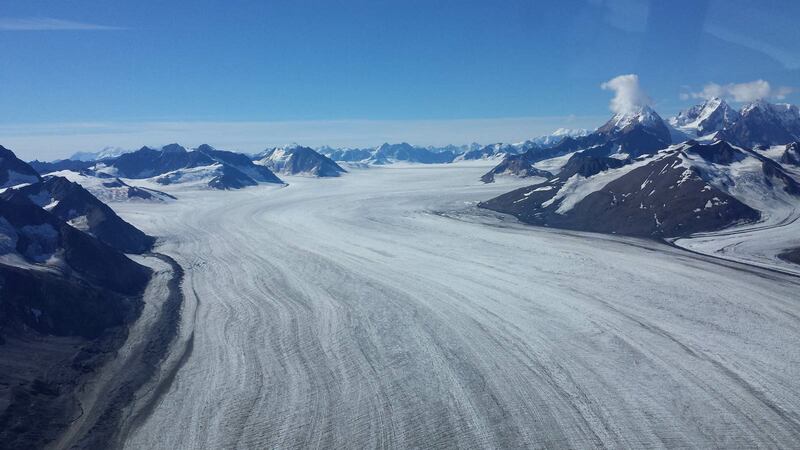 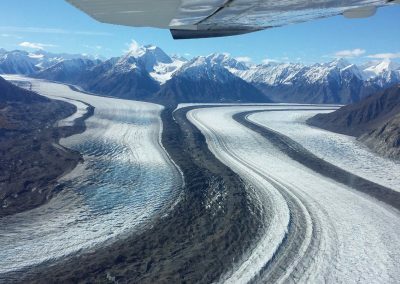 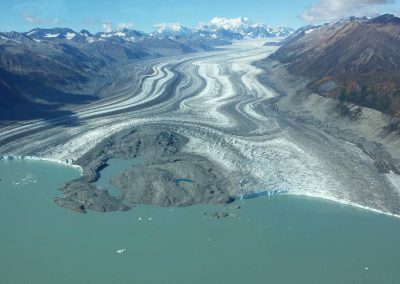 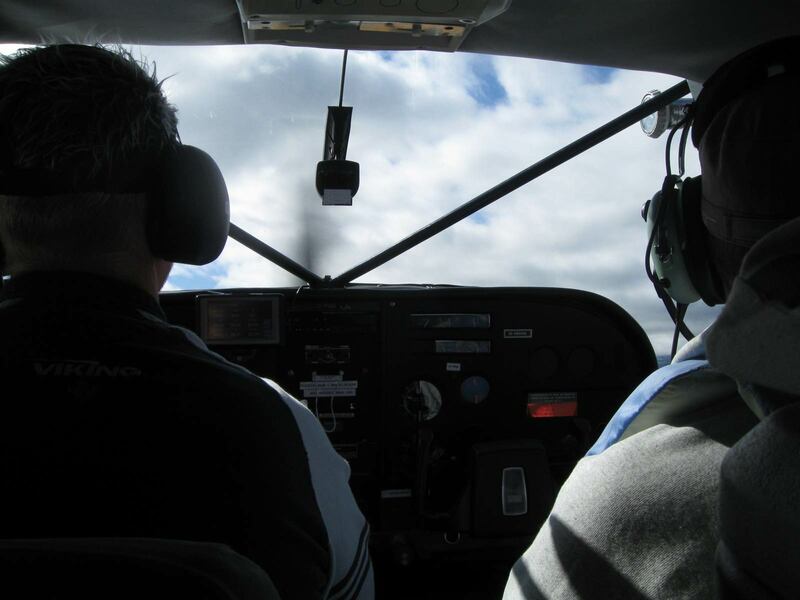 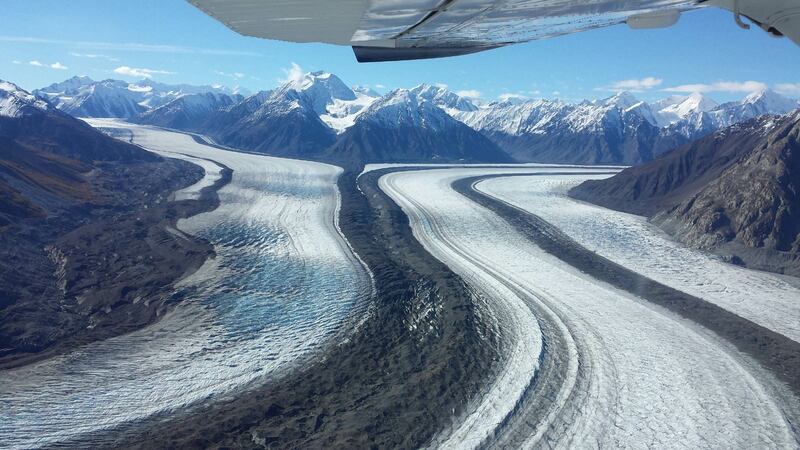 As a highlight of the tour, a sightseeing flight over the glaciers of the Kluane National Park and catch a glimpse of Mt. 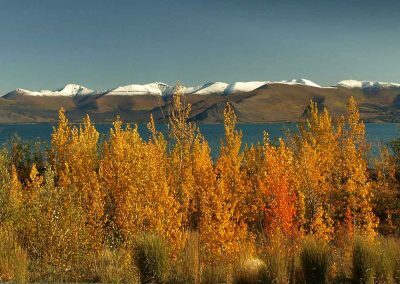 Logan, can be undertaken in the late afternoon – facultative. 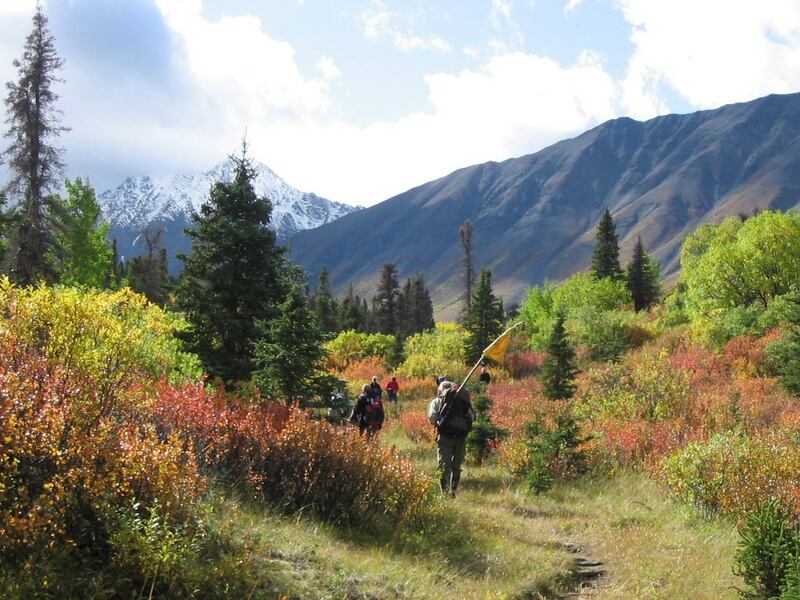 An adventure of the special kind is the trail to the “Kings Throne”. 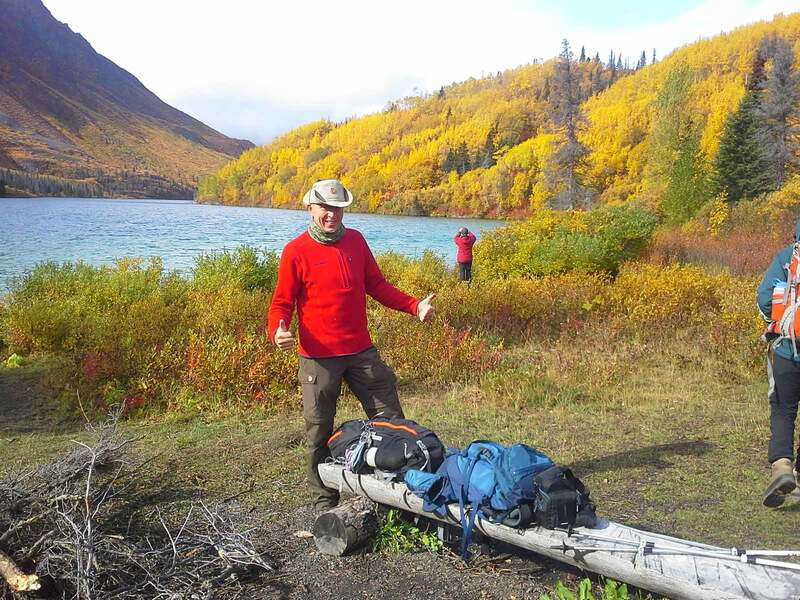 We start our hike on an old overland mail route directly at Kathleen Lake, which soon passes over to a norrow trail. 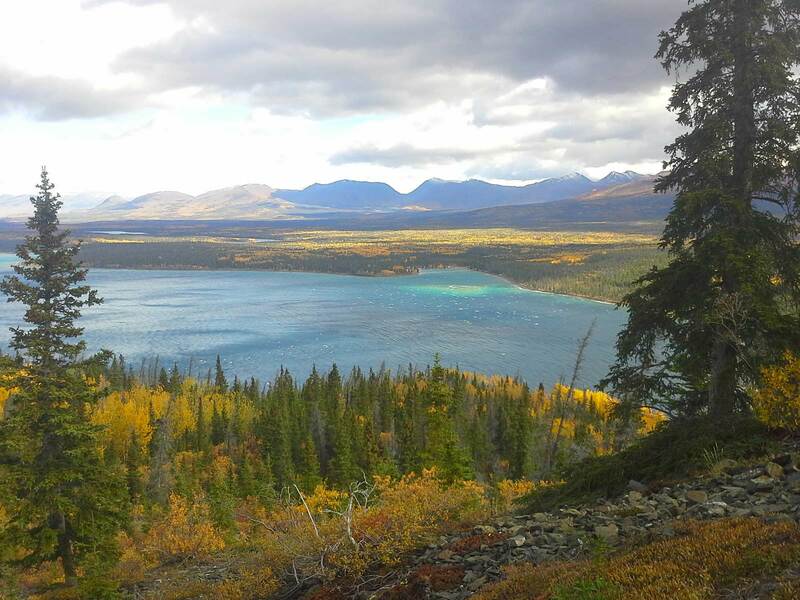 From Kathleen Lake we climb up to the “Kings Throne” on the eastern edge of the park. 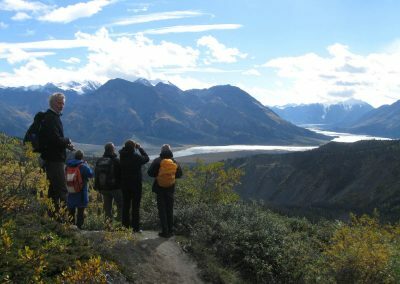 Under us the Kathleen River Valley opens and in the west we see the summits of the Kluane Range. 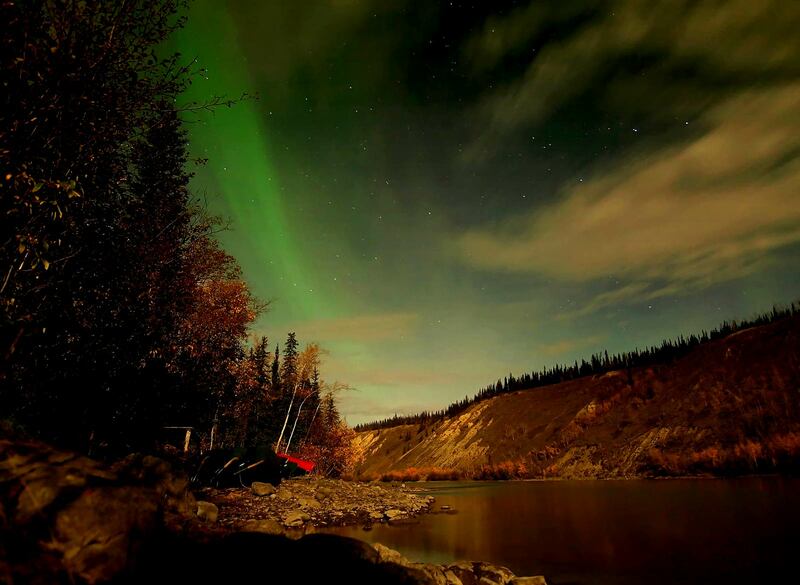 A breathtaking view and a great photo opportunity are offered to us. 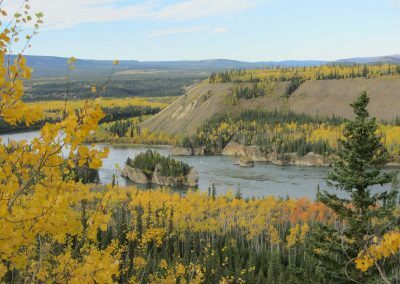 The hike to the King’s Throne is difficult and for the 10 km distance it takes 4 to 6 hours, elevation 548 m.
After breakfast we leave our accommodation and drive back to Whitehorse. 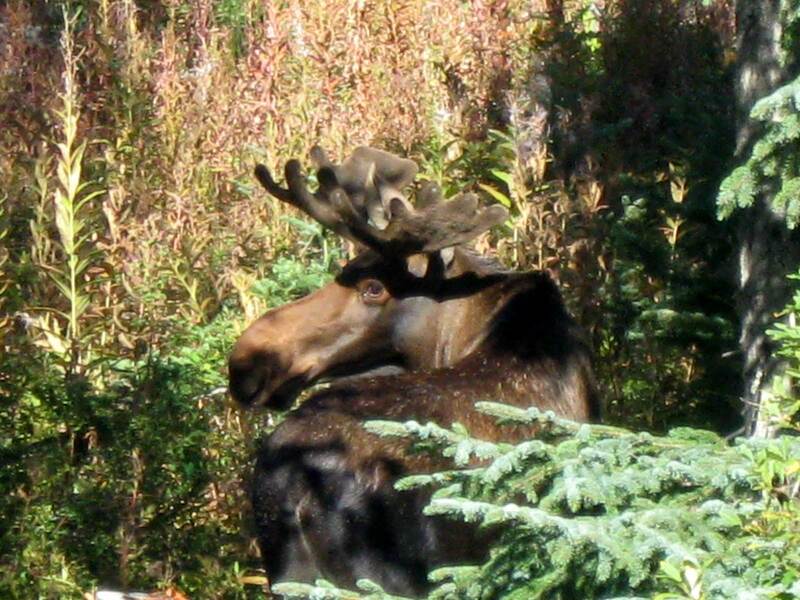 Meanwhile, there is still time for a stop to shoot one or the other photo. 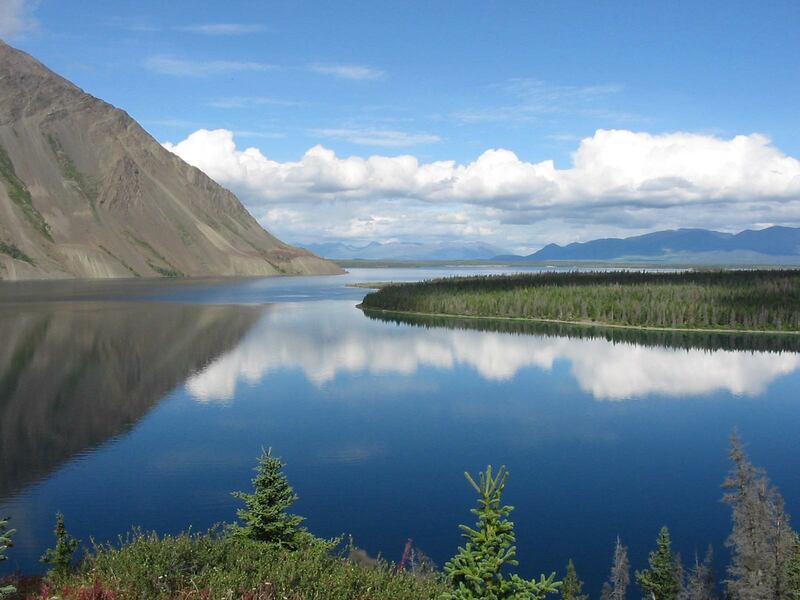 In the early afternoon we will be back in Whitehorse and check in to our hotel. 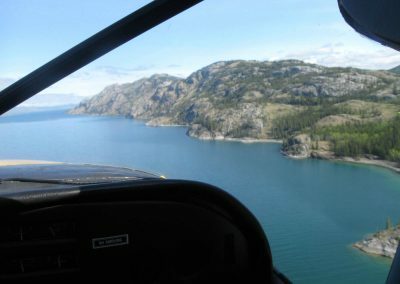 Afterwards you will have some time for a shopping and sightseeing tour. Your guide will be happy to give you some tips. 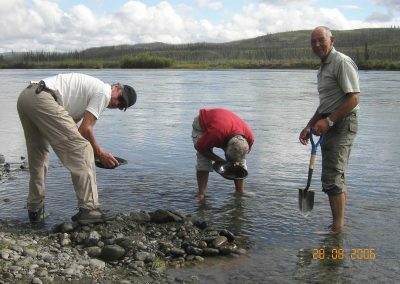 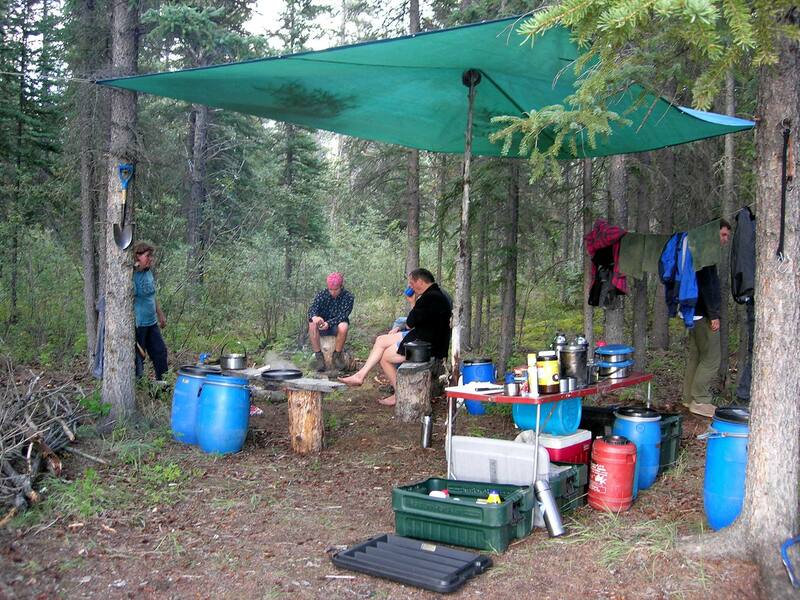 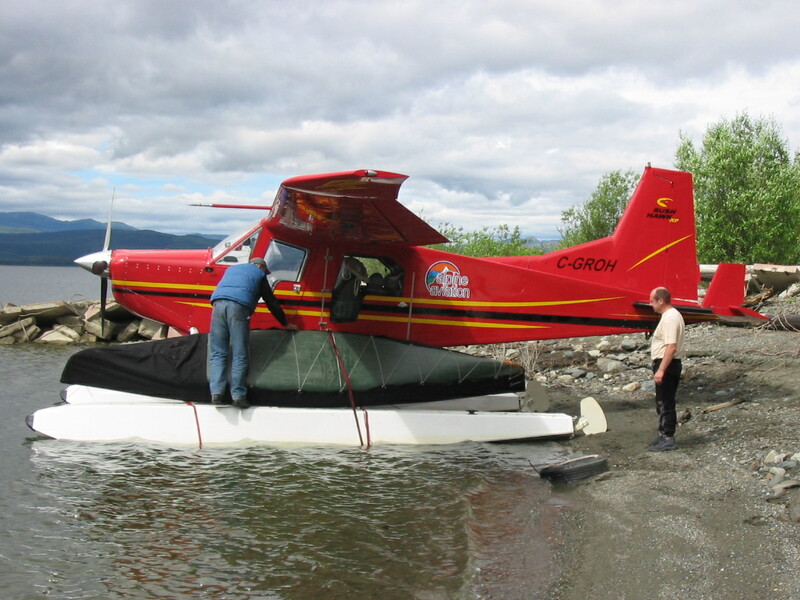 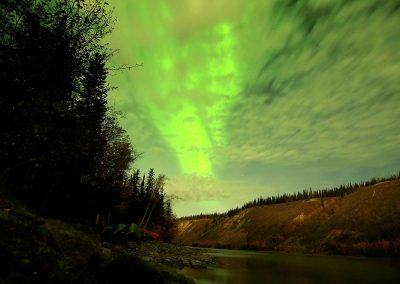 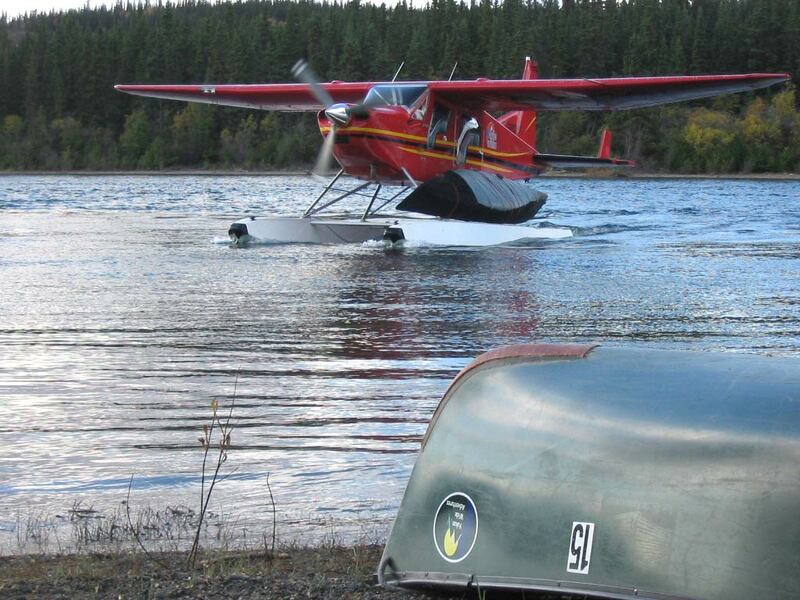 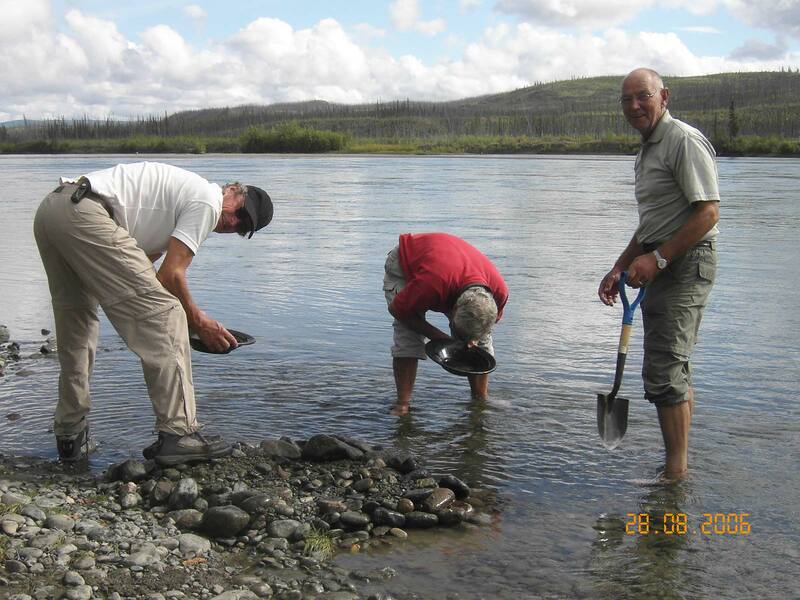 Later in the day, we will prepare us fo the upcoming canoe trip on the Yukon River. 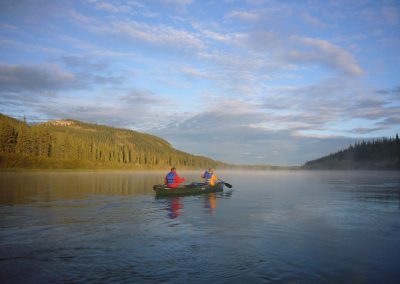 We will pick you up at the hotel in the morning and drive to Schwatka Lake, above Whitehorse. 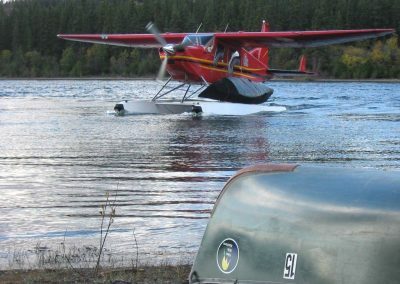 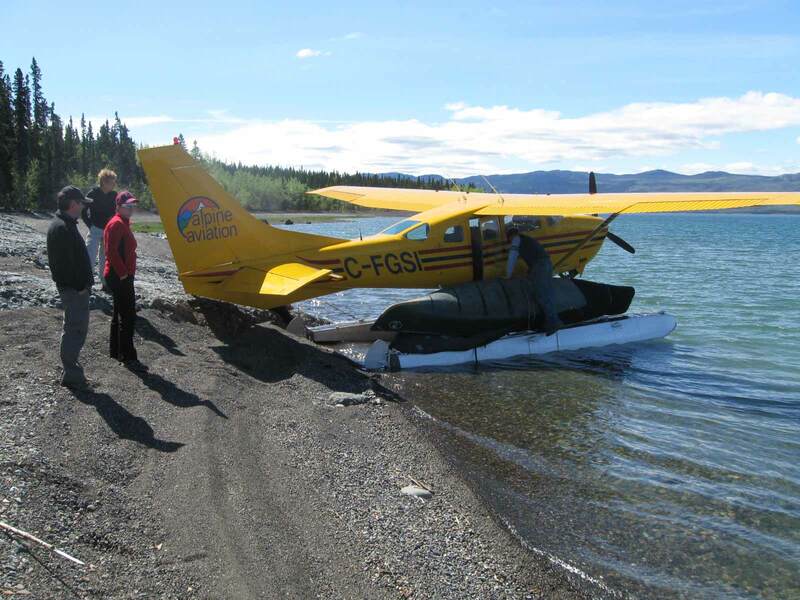 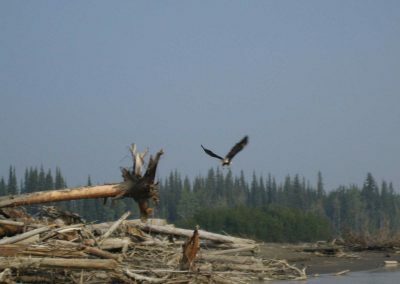 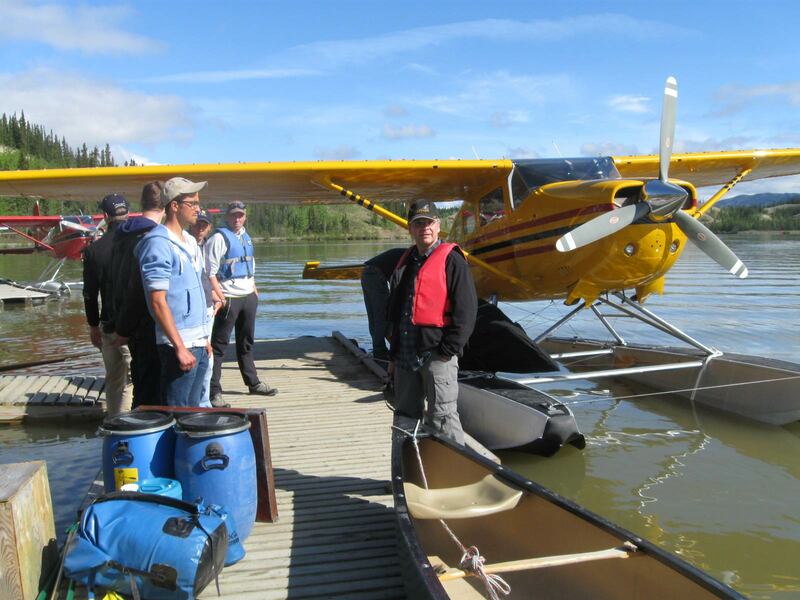 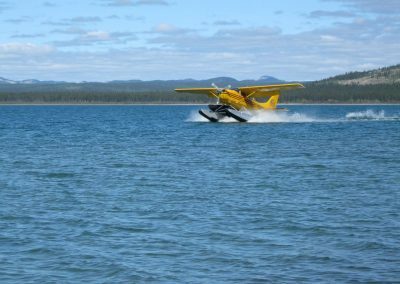 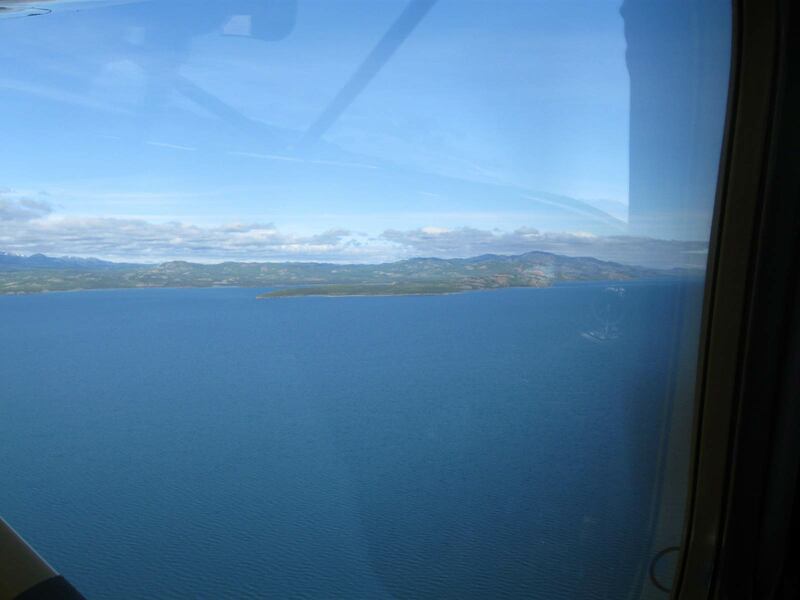 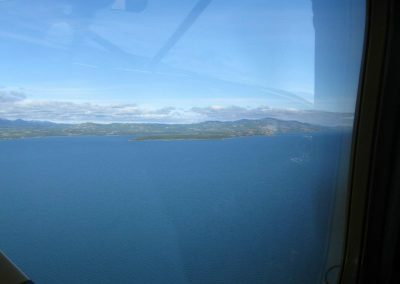 From there, we fly by float plane to Lower Laberge (about 40 min), the starting point of our canoe trip on the Yukon River. 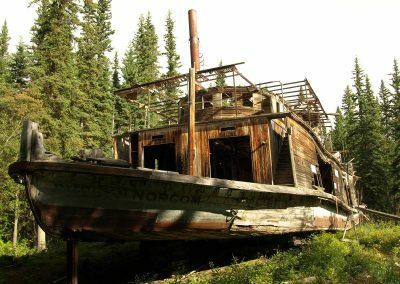 Once there, we set up our camp and then explored the historical relics of the once important trading post. 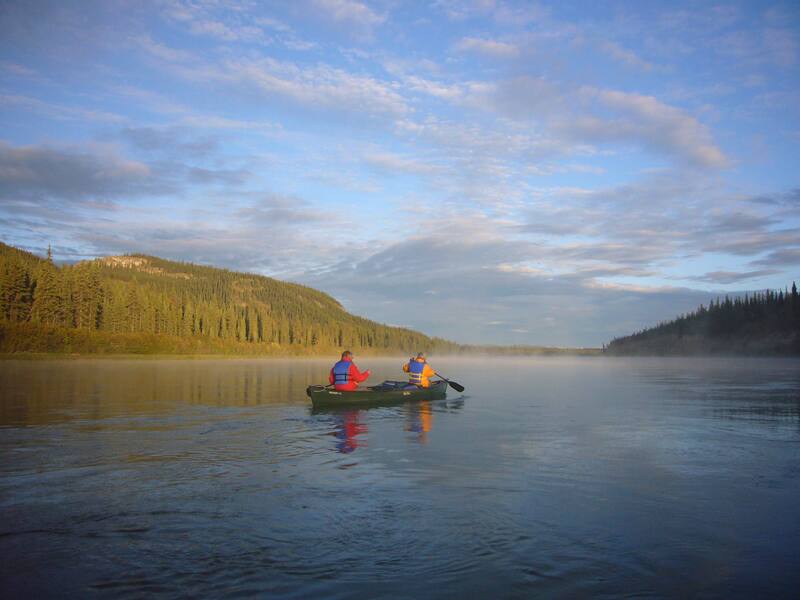 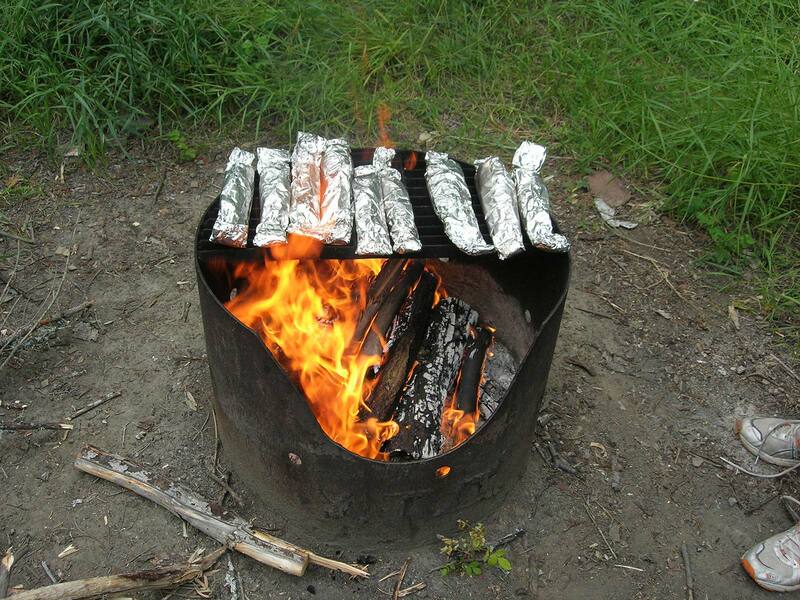 After a real Canadian wilderness breakfast we start our canoe trip down the Yukon river. 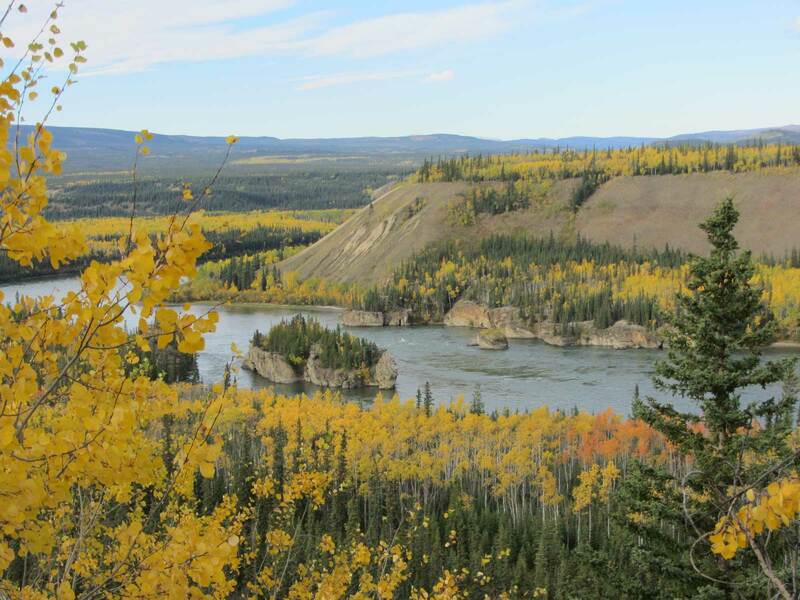 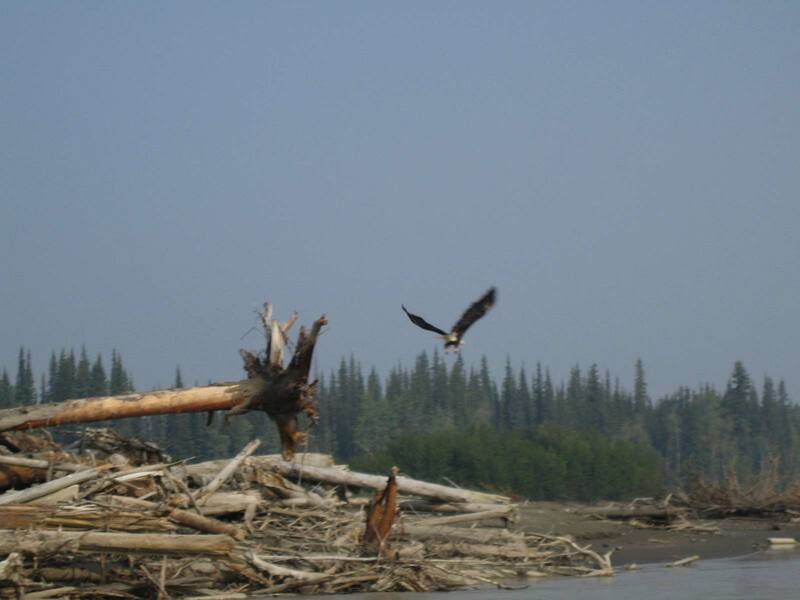 Our first stage leads us along the 30 Mile River to Hootalingua, the confluence from the Teslin and Yukon River. 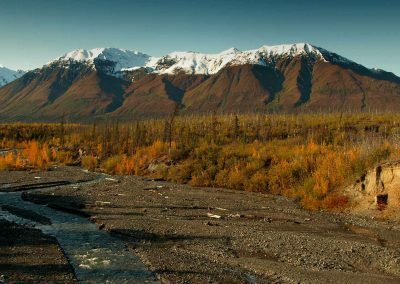 Here we also have the opportunity for a short hike of the surrounding mountains, with a magnificent panorama over the river delta. In the following days we experience the wilderness in our own camps, collecting wood for the evening camp fire and have time for some fishing. 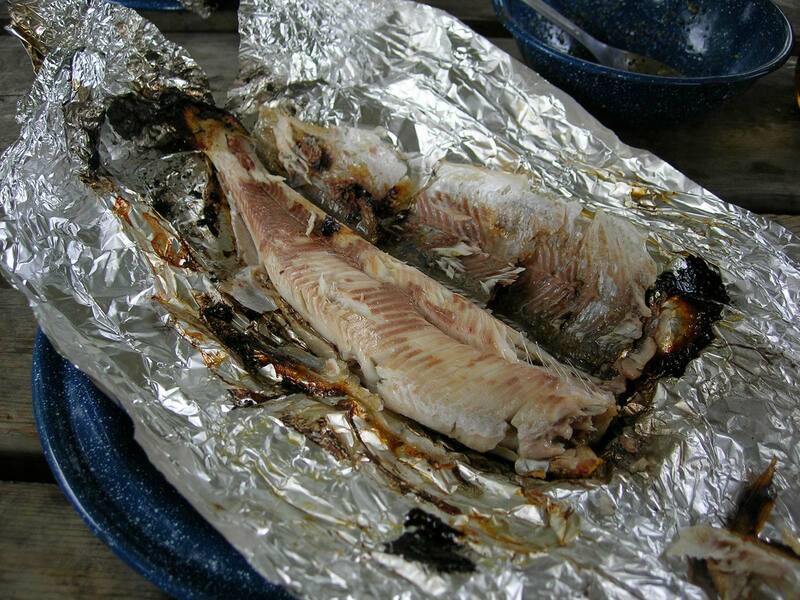 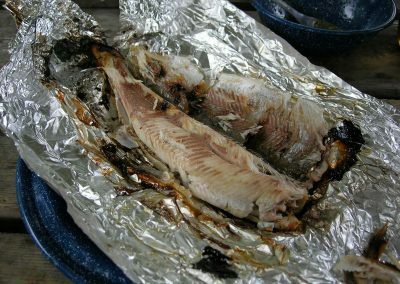 A freshly caught fish is always a welcome addition to our menu. 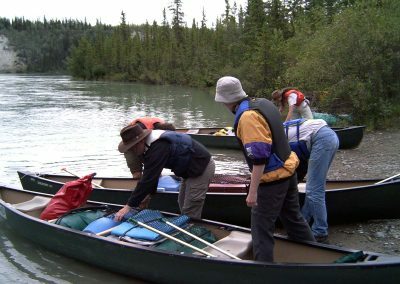 Shortly before the end and as a highlight of the canoe trip we pass the legendary “Five Finger Rapids”. 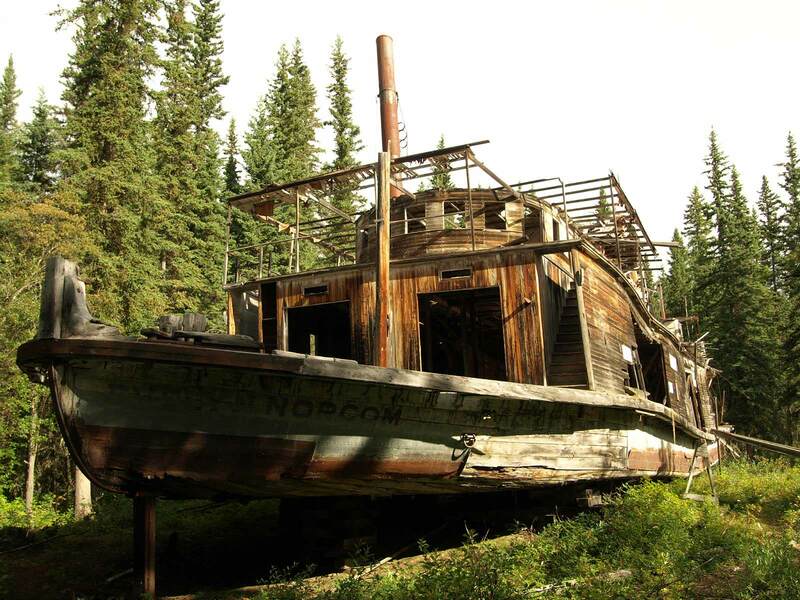 For the paddle-wheeler, this section posed a great danger to the gold rush time due to the narrow passage. 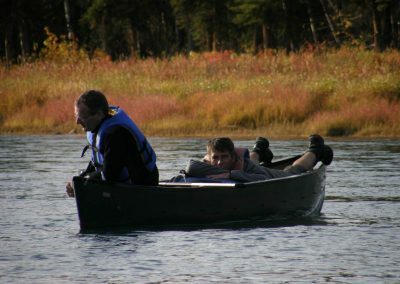 In the canoe, the passage is much easier and even a few unique pictures can be taken depending on the water level. 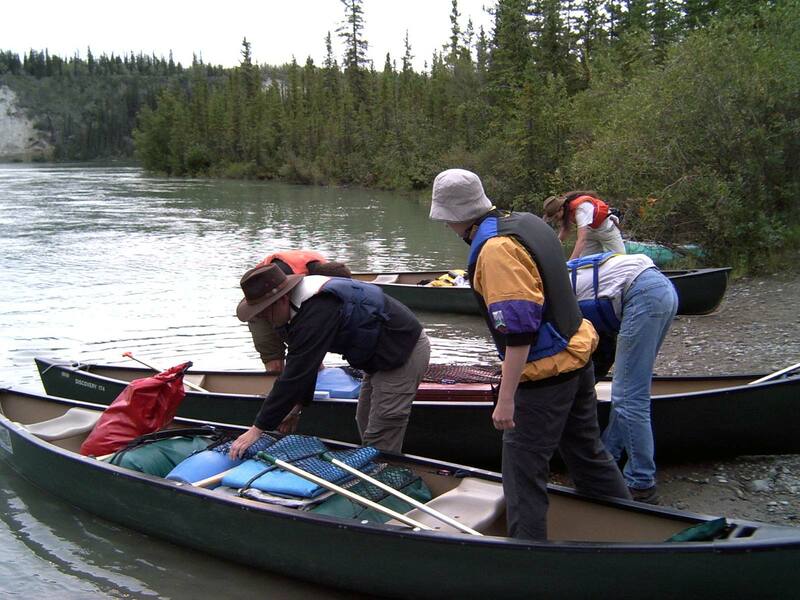 Shortly after the rapids we reach Tatchun Creek, the end point of our canoe trip. Over the Klondike Highway we drive back to Whitehorse. 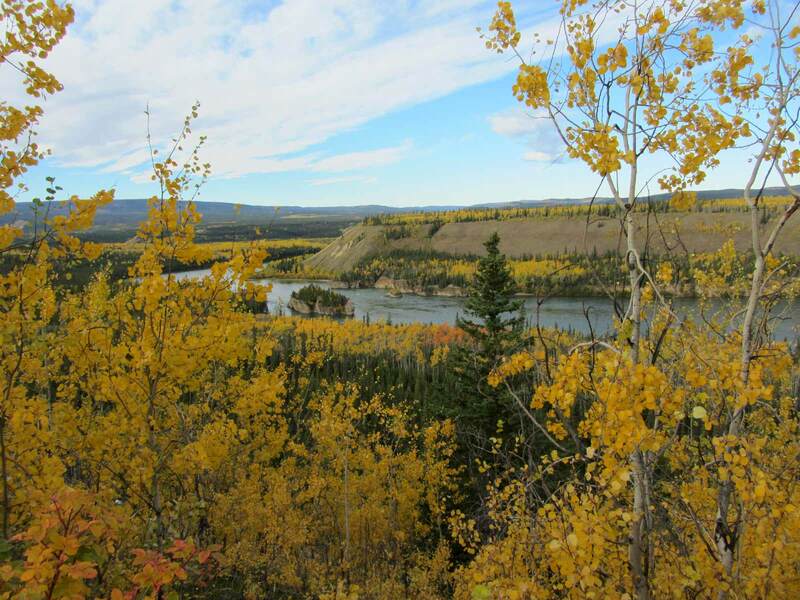 At the Five Finger Rapids viewpoint, we have a short photo stop. Arriving in Whitehorse, we check in for the last night at the hotel. 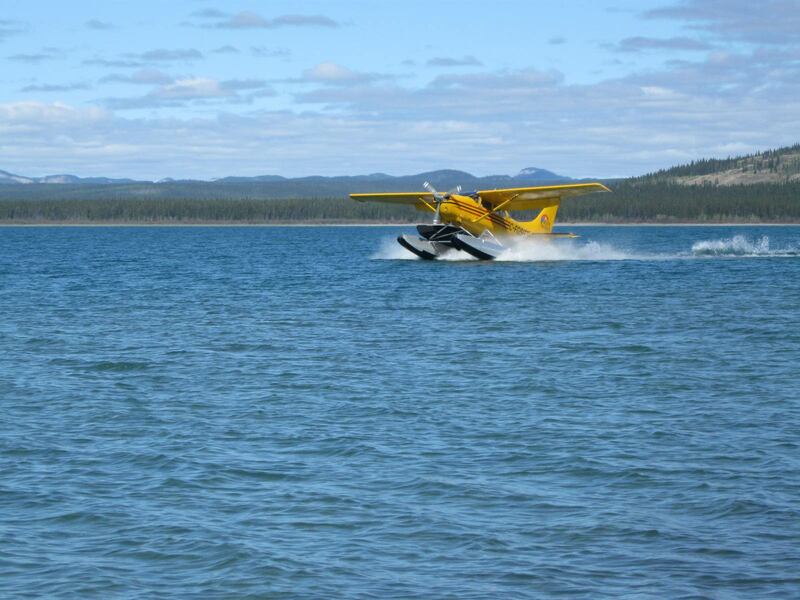 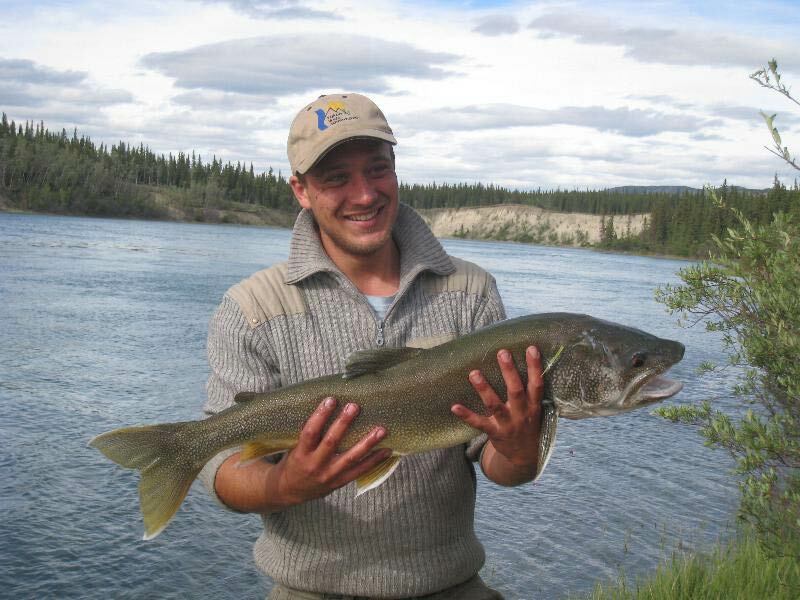 Shuttle from your hotel to the Whitehorse Airport and say “good bye”. 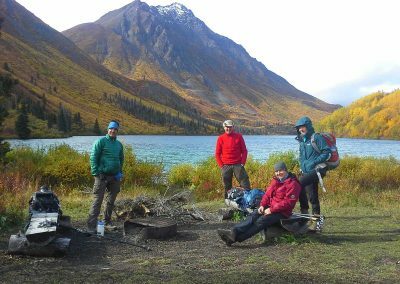 * In 2019 new and comfortable accommodation in the Kluane National Park at Mount Logan Lodge !